Is this the ultimate all-in-one for professionals? The iMac Pro is a powerful, professional all-in-one that certainly won’t be for everyone. It has oodles of power and a huge price tag to match. However, if the iMac Pro is suited for your needs, then you won’t be disappointed. As its name suggests, the iMac Pro is a powerful, sleek and beautiful all-in-one PC with the familiar iMac form factor. However, don’t judge this book by its cover – the iMac Pro absolutely demolishes the iMac 2017, and even the new iMac 2019, thanks to the overwhelming power and features available. When Apple first showed off the iMac Pro, it made some claims, saying that it’s the most powerful Mac ever made,’ and, well, it is. The iMac Pro is an incredibly powerful machine, built for creatives and professionals. And, at least until the Mac Pro 2019 arrives, that’ll likely stay true. However, the iMac Pro isn’t just about power for its own sake. This is a finely tuned machine, packed with beefy components that can do wonders for your workflow. The iMac Pro is very expensive, there’s no way around that, but if you shave some time off of all of your projects, this powerful all-in-one will pay for itself in no time. Time is money, after all. The iMac Pro may look like your standard iMac, but it’s aimed entirely at professionals, with workstation-level hardware that can easily cover way more than most people need for day to day computing, and with a price tag to match. However, if you’re a professional photographer, game designer or architect, then you would look at the iMac Pro as more of an investment. So, how much does the iMac Pro go for? Well, as you’d expect from a computer aimed at professionals, the iMac Pro is highly configurable, so there is a range in price when making the perfect iMac Pro for the needs of you and your business, as well as your budget. The baseline model of the iMac Pro costs $4,999 (£4,899, AU$7,299). For this price, you get a 27-inch 5K Retina display, an 8-core Intel Xeon W processor, AMD Radeon Vega 56 (8GB) graphics, 32GB of error-correcting code (ECC) memory and a 1TB solid-state drive (SSD). You can buy an iMac with a 10-core Xeon W CPU, 16GB of high-bandwidth memory (HBM2) AMD Vega 64 graphics and a whopping 2TB SSD. That model costs $7,999 (£7,599 and AU$9,539). The top-end iMac Pro comes with an 18-core Intel Xeon W processor, 128GB of RAM, 4TB of SSD storage and the same AMD Radeon Vega 64 GPU for $13,199 (£12,279, AU$20,419). Of course, that’s a huge investment, but you’re getting a heck of a lot of power as well. You can also tweak each of these configurations further, for example changing the SSD size, adjusting the amount of RAM or going for a 14-core Intel Xeon processor, which will alter the final price of the machine. The specs and high costs alone will let you know if the iMac Pro is for you. If spending almost as much as a new car on an iMac seems extravagant, then the iMac just isn’t for you. If you rarely use graphic-intensive programs, and you wouldn't know what to do with a GPU with 8GB – let alone 16GB of HBM2 memory, you should probably stay away from the iMac Pro. 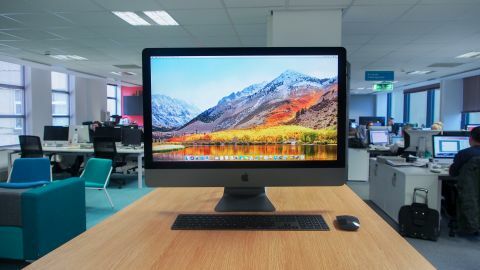 However, if you’re already invested into the Apple ecosystem, love the all-in-one design of the iMac and you need a pro-level workstation, the iMac Pro is your only real option – even a fully kitted out Mac Mini won’t reach the same level of power. The cost will be justified if you find yourself hanging around while your current machine renders 3D images or compiles code – spending this kind of cash to drastically cut downtime is an easy sell for the right buyer. If you’re looking for a bargain on the iMac Pro, Apple has started selling refurbished iMac Pros for a solid 15% off the list price. With the sheer power behind the iMac Pro, especially compared to the standard iMac, Apple really has done a bit of magic – maintaining the look of the all-in-one machine. All those impressive components are located behind the 27-inch display, leading to an attractive, minimalist machine that looks great in any office or studio. The fact that Apple has kept the body as thin as it has is also testament to the effort, and careful design considerations, involved in the creation of the iMac Pro. At the edge, the iMac Pro is just 5mm (0.2 inches) thick, meaning it doesn’t hog too much space on your desk. It also comes in at just 0.7kg (21.38 pounds), which means you won’t break your back moving it from desk to desk. Having such powerful components, which require more power and therefore produce more heat, means that a capable cooling system is required – especially considering the slimline design of the iMac Pro. Thankfully, Apple’s engineers have created an impressive cooling system for the iMac Pro, with dual fans that help circulate cool air over components, while expelling hot air. This design effectively cooled the iMac Pro during our testing, which included editing 4K HDR content in Final Cut Pro X, while also keeping the fans quieter. Yeah, it will heat up under pressure, but that’s the whole point of the cooling system, and we were impressed by how quiet it was. You don’t want any distracting fan noises while you work, especially in an all-in-one PC that’s right in front of your face, and the iMac Pro does an excellent job of mitigating that. According to Apple, the cooling solution, which includes a high-capacity heat sink and extra venting on the back of the device, allows for almost 75% more airflow and an 80% increase in system thermal capacity. All the while, the iMac Pro uses 67% more power than a 27-inch iMac. So, if you’re a fan of the iconic look of previous iMacs, but want a device that offers some serious hardware for professional use, then you’re going to be very pleased with the iMac Pro. One particularly noticeable difference with the iMac Pro’s design, compared to regular iMacs, is that it comes in a new color scheme: Space Gray. As expected, the Space Gray iMac is simply gorgeous, and the included Magic Mouse 2, Magic Keyboard and Magic Trackpad 2 also come in the new color, and are simply beautiful. Of course, as nice as the body and peripherals are, the most important aspect, especially for professional photographers, video or image editors, is the display. The 27-inch 5K display is described by Apple as its ‘best ever,’ with 500 nits of brightness, an increase of 43% over previous iMacs’ brightness. The 5,120 x 2,880 resolution is just as impressive here as it is on high end iMacs, which also feature this resolution, and the boost over standard 4K resolution means video editors can work on 4K video at full resolution while still having space for their editing tools. It’s little details like that that turn the iMac Pro into such a compelling option for professionals, and help speed up your workflow by eliminating the need to enter and exit full-screen mode if you’re on a 4K – or lower – monitor. Because the iMac Pro is designed for professionals, color reproduction has to be as accurate as possible. This is essential for photographers, graphics artists and video editors, amongst others. The screen supports the P3 wide-gamut color space, an RGB color space that is widely used in digital movie production. If you work with digital film, then this support will be hugely welcome, though not too surprising. Apple iMacs have supported it since 2015, as does the iMac’s competitor: the Surface Studio all-in-one by Microsoft. While P3 is wider than sRGB, it’s not quite as wide as Adobe RGB. So, if you’re relying on Adobe RGB – for example, if you work in printing and publishing – then you may be disappointed with the lack of Adobe RGB support here. For many people, however, the P3 color space will be perfectly fine and a big improvement over sRGB. On the bezel above the top of the screen resides the FaceTime camera, like with other iMacs, but there are a few major improvements here. For a start, it can record in 1080p resolution, whereas previous FaceTime cameras on iMacs were 720p. The boost in resolution is immediately apparent when using the iMac Pro for video calls. So, for client meetings, or chatting to work colleagues, this increase in video quality is greatly appreciated. The webcam also features four microphones, compared to a single one on the 5K iMac. This array of microphones also helps eliminate background noise and, as they are placed at the top of the screen (rather than at the bottom with previous iMacs), it does an excellent job of noise cancelling. Of course, if you work in very noisy environments, you’ll still want to use a headset for the best possible sound quality, but these improvements are very welcome. While Apple has caught flack for limiting the ports in its professional-oriented MacBook Pro, the iMac Pro suffers no such problems, with a decent array of ports that will allow you to hook up many peripherals to the device. At the base of the back of the iMac Pro, you get a 3.5mm headphone jack, SDXC card slot, four full-size USB 3.0 ports, four Thunderbolt 3 USB-C ports and a 10Gb Ethernet, which offers incredible network speeds. The four USB 3.0 ports are welcome for older, legacy, peripherals and devices, while the Thunderbolt 3 USB-C ports support Thunderbolt devices with up to 40Gbps data transfers, and USB 3.1 devices. The Thunderbolt 3 ports can also be used to connect extra displays, such as two 5K external displays at 60Hz, or four 4K UHD displays at 60Hz. Basically, you’re pretty much set for ports, and we’re glad to see that Apple hasn’t skimped here. However, while the slimline all-in-one design certainly looks impressive, it does mean that this is a workstation you won’t be able to easily open up, tinker with and upgrade components yourself. This may not be an issue for many people; however, if you want an easily-upgradable device for future-proofing, then this won’t be a device for you. Overall, the design of the iMac Pro is everything you’d expect from Apple: gorgeously made, with some genuinely innovative features and excellent professional-focused details that go some way to justifying the steep price tag. The iMac Pro comes with the Magic Keyboard with Numeric Keypad, Magic Mouse 2 and, optionally, the Magic Trackpad 2 – all of which come in the new (to the iMac range) Space Gray color. Apart from the new color, these peripherals should be pretty familiar. We were happy to get the Magic Keyboard that comes with a numeric keypad, as that’s a convenient addition for writing up sums. While we wouldn’t describe the typing experience on the keyboard as ‘magic’, despite its thin keys and shallow travel, it’s comfy enough to type on. However, if you’ll be doing a lot of writing, then you might find a more tactile keyboard more comfortable. In our view, the Magic Mouse 2 is much more successful. While the design hasn’t changed (apart from the color) since its debut in 2015, many would argue that if it’s not broken, don’t fix it. The mouse feels smooth and responsive in use, and handles well on a variety of surfaces. If you’re used to using Macs, then you’ll feel right at home, though again, for some tasks you’ll probably find it better to plug in a specialized pointing device. There is something we do still think is broken with the Magic Mouse 2, and which we’d love Apple to fix: the fact that to charge it, you need to plug the Lightning cable into the bottom of the mouse. Not only is this a rather inelegant way to charge, it also means you can’t use the Magic Mouse 2 while recharging its battery, a baffling design decision that we’re frustrated with Apple for failing to rectify. Finally, the Magic Trackpad 2 is a great peripheral with an edge-to-edge surface that lets you control the iMac Pro in a similar fashion to a MacBook. Used alongside the mouse and keyboard, it’s quite a nice alternative method for scrolling through files and websites, and zooming in and out of photos (among other things). The lack of change with these peripherals will please anyone who’s a fan of them, and annoy anyone who doesn’t like them, and was hoping for something a bit more special for the iMac Pro. The new color makes them look fantastic, it has to be said, and the Magic Keyboard and Magic Mouse 2 paired with the iMac Pro as soon as they were switched on. Strangely, the Magic Trackpad 2 didn’t pair automatically – we had to connect it to the iMac Pro via the included Lightning cable (which comes in black) before we could use it with the iMac Pro wirelessly.